Tuesday, Oct. 25-26, as part of the Journalism Alumni Fall Speaker Series. Lt. Col. Krenke, who holds two degrees from ASU, will speak and interact with students and faculty in classes and other settings. Born at Altus Air Force Base in Oklahoma, she graduated from Arkansas State with a bachelor of science degree in journalism in 1986 and earned her master’s degree in mass communications in 1987. Two years later, Krenke joined the Arkansas Air National Guard as an enlisted administrative specialist for the 223rd Combat Communications Squadron in Hot Springs. At that time, she was also a sportswriter for the Hot Springs Sentinel-Record. 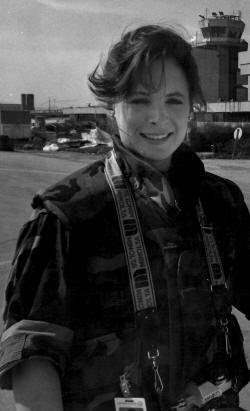 In 1990, Krenke was hired as a sportswriter for the Arkansas Democrat-Gazette in Little Rock, and subsequently transferred to the 189th Mission Support Squadron at Little Rock Air Force Base. Later that same year, she was selected for a public affairs officer slot with the National Guard Marksmanship Training Unit at Camp Joseph T. Robinson in North Little Rock. She was commissioned on June 5, 1991, by the Academy of Military Science at McGhee-Tyson Air National Guard Base in Knoxville, Tenn. In 1992, Krenke accepted an Active Duty for Special Work position as associate editor of the On Guard newspaper published by the Office of Public Affairs for the National Guard Bureau in Washington, D.C. She has been on extended active duty with the National Guard Bureau since that time. Krenke has completed Air War College, Air Command and Staff College and Squadron Officers School receiving the Writing Award for her squadron. She also has completed the Defense Information School’s Public Affairs Officers Course (short course in 1991 and long course in 1993) and the Air Force Executive Officers’ Course. In addition to the Defense Meritorious Service Medal and the Meritorious Service Medal with one oak leaf cluster, Krenke’s military decorations include the Army Commendation Medal with one oak leaf cluster, the Air Force Achievement Medal with one oak leaf cluster; the Air Force Outstanding Unit Award; the Air Force Organizational Excellence Award with two oak leaf clusters; the National Defense Service Medal with one oak leaf cluster; the Global War on Terrorism Service Medal; the Air Force Longevity Award with two oak leaf clusters; the Basic Training Honor Graduate Ribbon; and the Air Force Training Ribbon. Krenke resides with her husband, Bob, in Alexandria, Va. They have three children, April, Grace and Brett.